"Ladies and gentlemen, here is the result of event nine, the one mile: first, #41, Roger Bannister ... It took a wholesale reimagining of running itself, as each generation built on the discoveries and secrets of the last, until the fateful day finally arrived, and an impossible dream became reality:6 May 1954. "Ladies and gentlemen, here is the result of event nine, the one mile: first, #41, Roger Bannister ... with a time which will be a new English Native, British National, All-Comers, European, British Empire and World Record. The time was three..." As the announcer spoke those fateful words, the crowd roared, and the century-long quest to run 'the world's greatest race' was finally at an end. For decades, amateur athletes like the American Lon Myers, a stick-thin hypochondriac who was sick before and after every race, yet still held every US record from 50 yards to the mile, and Joe Binks, an English journalist who only trained once per week, dominated the field. Paavo Nurmi, the 'Phantom Finn', won nine Olympic gold medals and set so many world records that statisticians still argue over the total, but even he couldn't breach the magic four-minute mark. As competition intensified, the Swede Gunder 'the Wonder' Haegg ran the mile in 4:01.4 - but it took the legendary Roger Bannister and his two co-runners to finally accomplish 'the most significant sporting achievement of the twentieth century'. 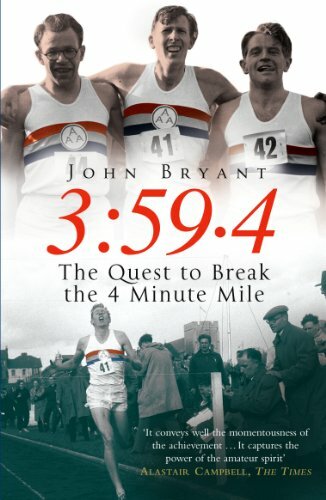 It took a wholesale reimagining of running itself, as each generation built on the discoveries and secrets of the last, until the fateful day finally arrived, and an impossible dream became reality: 6 May 1954. Roger Bannister. 3:59.4.